There are many other photographers – what does AShapiro Studios do differently? Short answer: We help event producers show value to people that spend money. That could be the sponsor of an event, a company’s customer or client, the people that attend an event, and sometimes the management within a company that decides what budget a department has to work with. Many of those boxes were ticked yesterday as Reyka Vodka was one of the sponsors of the Fremont Festival in Seattle for Solstice. The liquor industry, from the business side, works much like many other companies out there. There’s manufacturing, importing, sales, marketing, HR, etc. There are global teams (that deal with top-level concepts like supply – or making sure countries around the world have as much product as they need), domestic teams (that deal with things like marketing the products to the US), and local teams (that take those marketing ideas, shake ’em up with some local twists, and make them happen). Local teams get their budgets from those national teams, but how successful are those efforts? Who’s enjoying the products? What kind of visibility did the brand get? These are the things marketers care about. Bean counters and sales people can get everything they need from a spreadsheet – Marketers want to know emotions, and see demographics, and understand how the message was used. That’s where AShapiro Studios comes in. 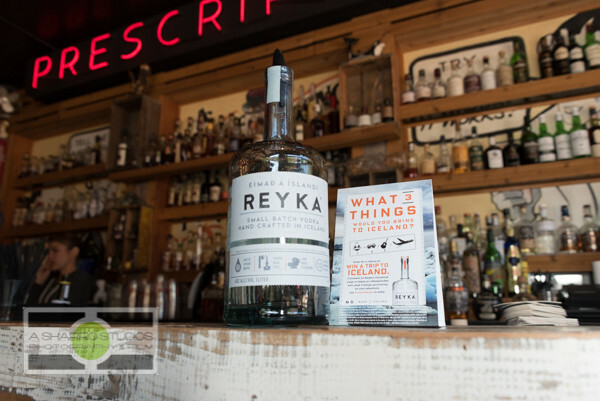 For Reyka Vodka at Solstice celebrations around the world, all chips are on the table (a Twitter search of the hashtag #ReykaSolstice will give you a glimpse of what I’m talking about). Global and National had their plans, and it was up to local to make it happen. 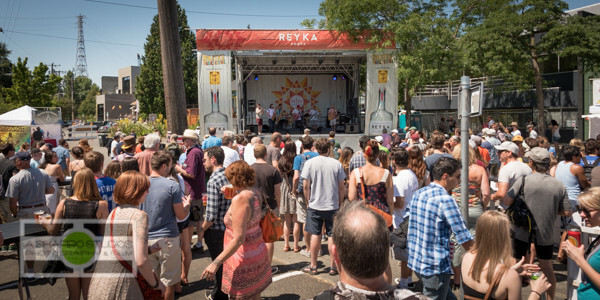 In Seattle, The Fremont Solstice Fair is one of the largest early-summer events in the city and a perfect event for Reyka Vodka to tie into. 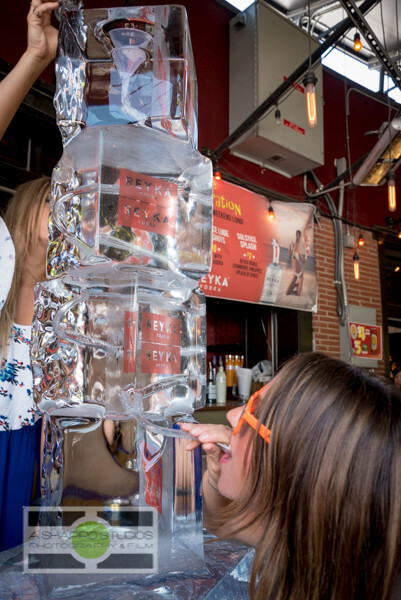 Live music, a parade (including naked bicycle riders), and beer gardens – featuring custom Reyka cocktails, plus a Reyka Vodka shot bar. 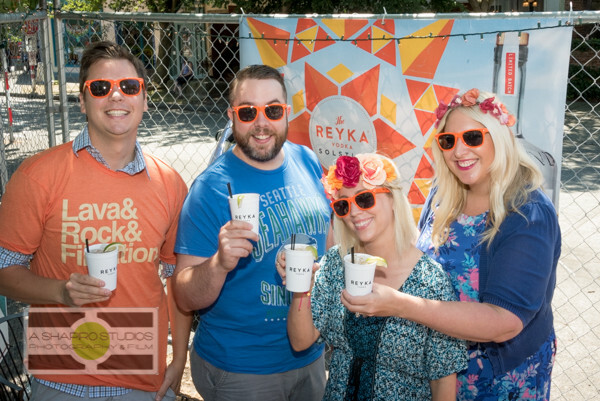 Reyka was everywhere at the Fremont Solstice Fair – but that’s not all. With lots of bars and restaurants in the area too, Reyka took their experience outside the walls of the festival and into these bars. As a Seattle Event Photographer, my job is to capture all of that. When these pictures get sent from the local team back to the national team, it’s important that I can give them the ammunition to say ‘this is what we got for the money we spent’ so that next year they can beef up those efforts even more. Whether my client’s budget for an event is $20,000 or $200,000 (or $2million), spending a few hundred dollars on custom photography that helps them show that value to the people that sign the checks is invaluable. You can see the entire gallery from Reyka Solstice delivered to my client, and I also wanted to share how I made a couple of the photos in that gallery. Over the 3-hour shoot, I clicked the shutter 840 times (between 2 different cameras) and delivered 112 to my client. Why? What happens to the other photos? Why don’t I give the client everything? 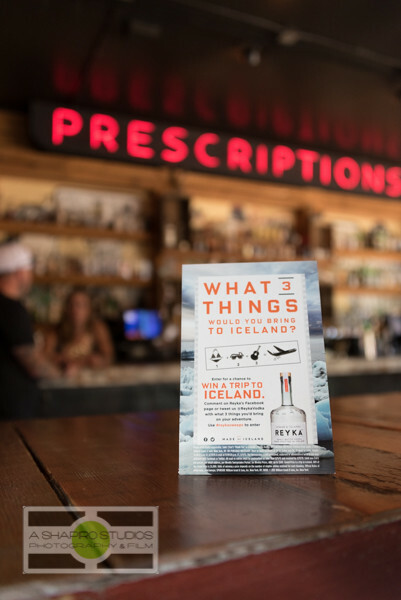 One of the bars that Reyka Vodka teamed with is called 9 Million in Unmarked Bills – with a large main bar area, a second smaller bar for more specialty drinks, and plenty of outdoor seating. 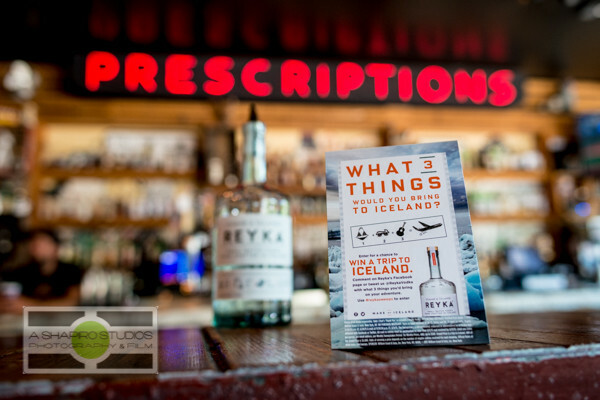 Reyka Vodka created a custom menu for the bar along with some other signage around, including info on winning a trip to Iceland (where Reyka is made). 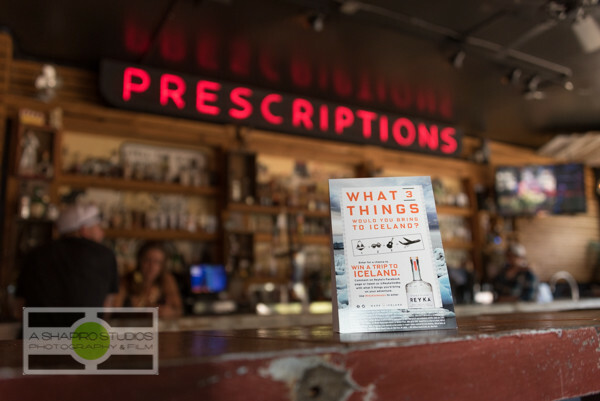 One of the landmarks of the bar is a large neon “Prescriptions” sign above the back bar. So, first thought – a photo of one of the sweepstake flyer with the neon in the background. Sure, this works, but it doesn’t have what I want. The neon is too clear, which draws away from the text on the flyer, and the people are a little distracting. OK, shallower depth of field, and let’s try portrait. Better, but still not there. The sign is still too clear, and the photo overall is missing something. Let’s put a bottle in there! No No No. I’m missing the scale of the bar and the bottle is too blatant. Pulling back again gave me what I wanted – the first photo delivered. Yes. Good. 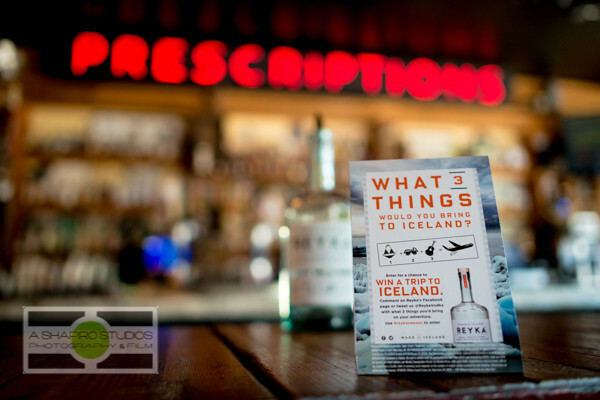 A nod to the neon, clearly (to the people that will be using this photo) a back bar, outlines of people at/around the bar, the flyer and a bottle of the product. Yup, I can give the client that one, but what if they want the bottle more in focus? No problem – let’s do that one too. By adjusting the aperture a little (which controls the depth of field), I brought back a little clarity in the neon (the down side) but now you can see the label on the bottle more clearly (the upside). Both of these photos can be useful. Both of these photos tell a story. Now my client has both and can use either one – or both. Across the street, The Ballroom had a fun ice luge for shots too. 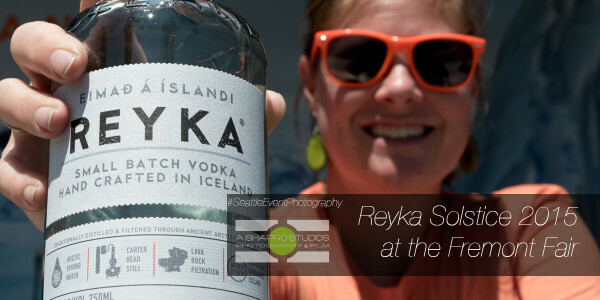 A really fun day shooting Seattle Event Photography for Reyka Vodka at the Fremont Solstice Festival! 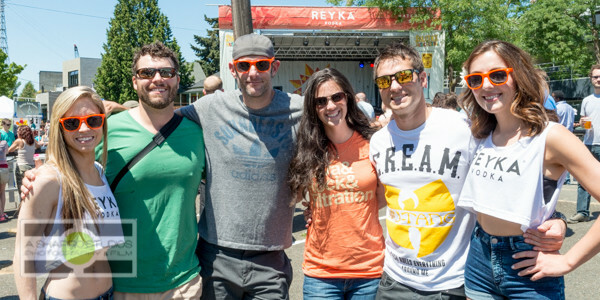 Check out the entire gallery from Reyka Solstice at the Fremont Festival here.